The stylish and slim COOLPIX S2800 turns fun family moments into beautiful memories you can cherish forever. Capture every detail with ultra-sharp 20.1-megapixel photos, or capture every sight and sound with dazzling HD video that can be played back on a compatible TV. Make your friends and family (or yourself) look great in portraits—Advanced Glamour Retouch softens skin tones, reduces glare, reddens cheeks and more. Easily highlight one colour in a black & white photo, give your shot an old-time look, make a scene look miniature and much more. COOLPIX S2800 takes out all of the worry so you can just point, zoom and shoot! And since it's slim and stylish, you'll gladly take it everywhere and bring home more great memories than ever. Create beautiful high-resolution photos and videos with ease. The COOLPIX S2800's high-performance NIKKOR glass lens is paired with a 20.1-megapixel CCD image sensor that captures bright, vibrant images you'll love sharing. Experienced photographers optimize their camera settings to match the situation. The COOLPIX S2800 does that work for you. With 18 Scene Modes, including Beach, Snow, Night Portrait, Sunset and more, it's easy to match the moment to a Scene Mode. You can even get creative and use Scene Modes to alter ordinary shots. Or, select Scene Auto Selector and let the camera choose the best mode for your situation. Form and function can play nicely together, and the COOLPIX S2800 is proof. Ultra-thin and lightweight, it fits comfortably in your pocket or purse. But you won't want to hide it there—every time you pull out the COOLPIX S2800, you can expect someone to comment on its good looks. Consider it a stylish accessory for your already fashionable life. It's frustrating when a smartphone camera focuses on the wrong thing. With COOLPIX S2800, Target Finding AF quickly determines your intended subject and puts the focus where it belongs—on your subject. A great smile makes for a great portrait. 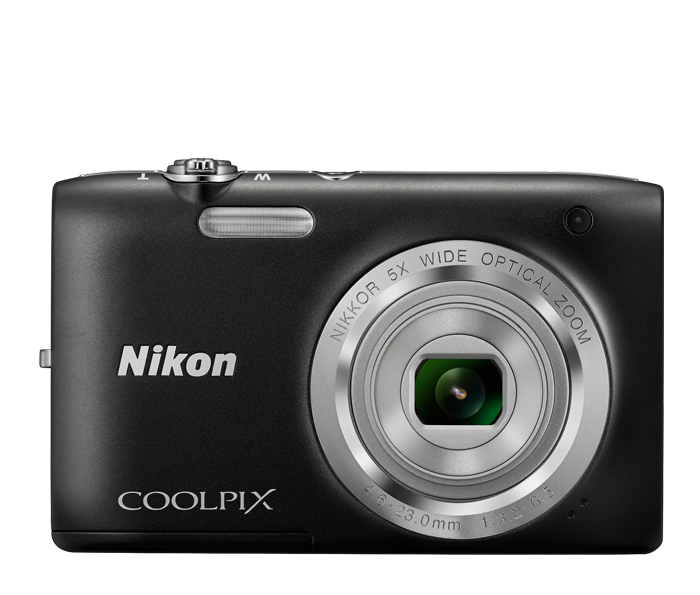 With Smile Timer, the COOLPIX S2800 automatically takes a photo the instant your subject smiles. Easily catch exactly the right moment.